I wanted to share a story that once again underscores the importance of perseverance. As part of the board for our local AMA (American Marketing Association) chapter, I plan and manage events. I’m a big fan of Piada Italian Street Food, a fast, casual chain based here in Columbus that started out with one location. When they announced their nationwide expansion, which I read about in Columbus Business First, I thought it would make a great topic for our audience. So, over a year ago, I started reaching out to Piada’s director of marketing Matt Eisenacher to invite him to present at one of our events. Unfortunately, last fall, the timing was off. But, I kept in touch with Matt and followed Piada news, keeping them in mind for a future event. A few months ago, when I was planning fall programs for this year, Matt came to mind again. I followed up with him, and I’m pleased to say that yesterday, Matt spoke at our September luncheon. He was engaging and insightful, a big hit with everyone. Success! Sometimes when you start putting the pieces of a plan in place, you don’t know that they’ll all neatly fit together. In this case, the stars aligned. Here’s to the power of perseverance! 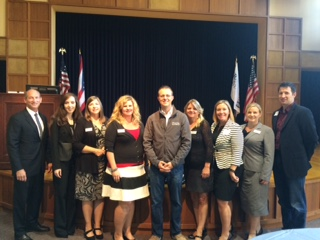 Columbus AMA board members with Matt Eisenacher of Piada.